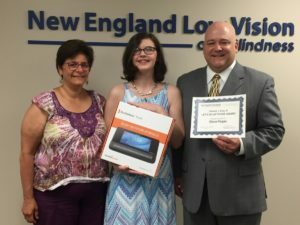 On June 18, 2018, New England Low Vision and Blindness announced that Elana Regan, a 9th grade student at Hopkinton High School, is the winner of the 2018 Clement J. Krug, Sr. Let’s Go Attitude Award. 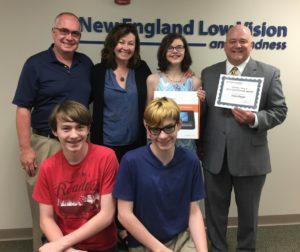 This award was established in honor of the spirit of the late Clement J. Krug, who is the father of company President Scott V. Krug, recognizing one special student with a similar attitude, who never gives up. The winner of the award receives one technology product valued up to $6,000. 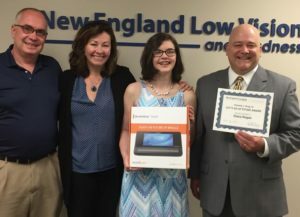 In recognition of the 2018 Clement J. Krug, Sr. Let’s Go Attitude Award, Elana was presented with a new BrailleNote Touch 32 Cell, a two year warranty and a personal, one-on-one training from both Michelle Perkins, Senior Assistive Technology Specialist and Trainer at New England Low Vision and Blindness, and Kate Morrow, Regional Director of HumanWare. Elana was nominated by Jane Rosen, a Certified Orientation & Mobility Specialist from the Carroll Center For The Blind. 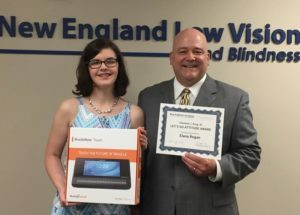 For more information about New England Low Vision and Blindness, Clement J. Krug, Sr. Let’s Go Attitude Award, or any of the products and service, visit www.nelowvision.com or call 888-211-6933. You can also read Elana’s touching essay <clicking here>.